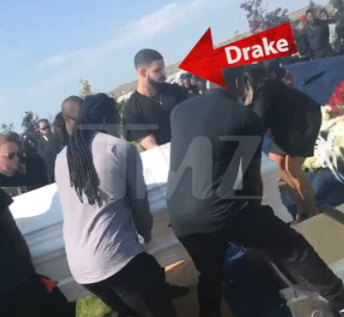 Drake was at the funeral of his longtime friend and OVO affiliate, Anthony "Fif" Soares, which took place on Saturday. Fif was shot to death by two gunmen on Thursday, September 14 in his apartment lobby at Scarborough, Toronto (read here). Drake was at the funeral which held over the weekend at the Ogden Funeral Home chapel in Scarborough, Ontario. The Canadian rapper later traveled to the Duffin Meadows Cemetery where he served as one of the pallbearers for the casket. Eyewitnesses said Drake did not speak at the procession, and mostly kept to himself.